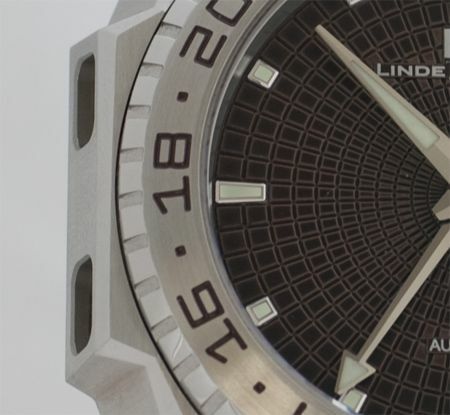 Linde Werdelin’s 3-Timer is almost ready for production. Since the introduction during BaselWorld last March, the 3-Timer probably has become – together with the SpidoLite – their most popular model of the collection. With only a limited run of 22 timepieces for the brown dial version, this is probably going to be an instant hit. I have ordered one after seeing it during BaselWorld 2009, and opted for the brown dial version right a way. About a week ago, I received Linde Werdelin’s prototype brown dial watch and will share some of my experiences and opinions with you. Since this is a prototype watch, I don’t want to write a full review yet. Anyhows, below you’ll find some of the things that (I believe) really sets this watch apart. 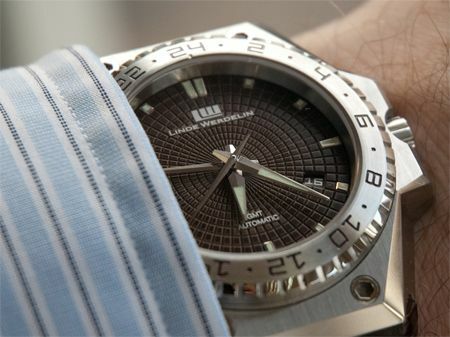 The eye for detail by Linde Werdelin is superb. 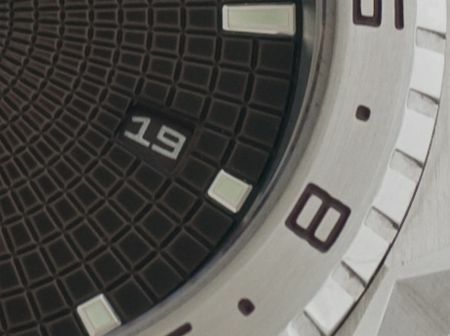 As you can see on the photo above, the numerals in the bezel are in the same brown color as the dial. At first I couldn’t believe that this was true, and had to do a double check with a loupe. The photograph clearly shows the brown color, but when there is little or no good light around, it is quite hard to detect. The same goes for the date wheel. A matching color has been used for this part as well. I cannot understand that there are still watch brands who use the standard white date wheel with black printing. Another cool detail is that the brown squares (which aren’t really squares) are not evenly brown. The sides of the ‘nobs’ are a few shades lighter, this creates a very impressive dial, that reminded me of a tortoise-shell. The strap of this watch is a so-called Tracked Calf strap. 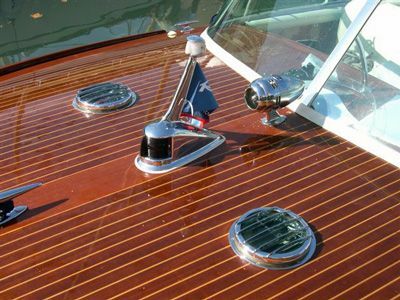 I have seen similar straps before, for Panerai watches, and they were called Riva straps because the pattern is reminding us of the famous mahogany Riva decks. So, I will stick to Riva strap as well 🙂 I have to admit that I never got so much comments on a watch before, and especially on the strap. It really makes the watch stand out. The prototype watch that I have came on a LW signed buckle. Folding clasps are also available, but I do not fancy folding clasps as they appear to either stick into the back of your wrist or make the strap a bit too ‘thick’ on the back of your wrist. One of the other cool things about this watch is the design of the case. First of all, the edges of the case are really sharp. The polished and brushed parts really play with the (sun)light, as similar case designs do as well (think AP Royal Oak). The large hexagonal decorative screws give the watch a bit of an industrial look, which I happen to like 🙂 Same goes for the bezel, besides the brown numerals, the bezel consists of a polished and brushed part, as you can see above. The Linde Werdelin case design reminds us of the Audemars Piguet Royal Oak series, but what I only discovered after wearing the watch for a day or so…. the watch case also reminds me of the Patek Philippe Nautilus. Look at the ‘ears’ of the watch, not entirely Nautilus, but it does remind me of one. The sides of the watch also have a function, namely that of clamping The Reef or The Rock instruments to the watch. Now, I am not an avid rock climber or diver, but at least I know it is possible to attach one of these neat little computers to the watch. Just in case. As for how it wears… it is certainly bigger than any of the other watches I currently have in my collection, including an IWC Ingenieur 3227 (42.5mm). However, as you can see two pictures up, it still fits under my cuffs. It actually wears quite comfortable, even with the stiff Riva strap. The case back of the watch is quite flat, and the lugs are positioned under a slight angle, to fit your wrist better.The luminous stuff on the dial (I assume it is Luminova) really works well in the dark, also even after a short moment of exposure to the sunlight. I didn’t check the watch for its accuracy, but will do so with my own brown 3-Timer of course. I think it is a bit unfair to put a prototype watch on a Witschi device, as I don’t think this watch is about the movement. Although the mechanical automatic movement has an extra timezone, the movement is not the most important factor of this watch. However, I am confident that the used ETA 2893-A2 (derived from the famous 2892-A2) is able to do the job right, as it does for a number of other models and brands as well. Any negative points? So far so good I think… the design is very specific and will not be to everyone’s liking (one can see this as a plus! ), perhaps the price of 4800 Euro is a bit on the edge for an ETA powered watch, but then again.. it is not only about the movement.. I think 4800 Euro (4080 Euro for the black dial model, limited to 222 pieces and without Tracked Calf strap) gives you a watch with a unique case design that really stands out and which makes it possible to upgrade it with one of their neat little wrist computers (The Reef and The Rock). 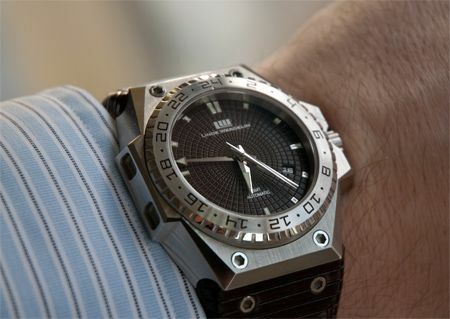 And again, I was really amazed by the fact that this watch is so comfortable on the wrist despite the size of the case. To me, it is also important that I can wear the same watch either in my spare time or at the office (with a suit). This watch easily can do both. As they say in German, this watch is ‘Der Hammer’. 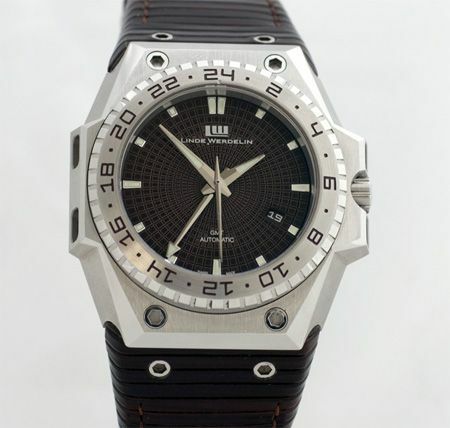 This prototype makes me want my number ’13’ brown dial watch even more….